Thousands of people attends a "Lovefest" vigil against terrorism in central Stockholm, Sweden, Sunday, April 9, 2017. A hijacked truck was driven into a crowd of pedestrians and crashed into the department store on Friday in the Swedish capital. Tens of thousands of Swedes turned out in Stockholm Sunday for what they called a "lovefest" after Friday's terrorist truck attack killed four people and injured 15. A 39-year-old Uzbek believed to have extremist sympathies is under arrest for allegedly ramming a stolen truck into a crowd at the Ahlens department store. "Fear shall not reign. 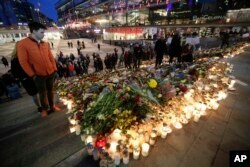 Terror cannot win," Mayor Karin Wanngard told a crowd estimated at 50,000. One woman held a poster reading: "We don't respond with fear, we respond with love." Friday's attack apparently had little effect on liberal Sweden's global reputation as an open and welcoming society. One participant at Sunday's rally told the Associated Press that the fact the suspect is a refugee means nothing. "This is a sick individual and has nothing to do with his refugee status. I think most Stockholmians realize that just because you are a refugee or a Muslim doesn't mean you are a terrorist." Candles and flowers placed in central Stockholm to commemorate the victims of last Friday's terror attack in the city, in Stockholm, Sweden, April 9, 2017. Police arrested the Uzbek-born suspect hours after the truck attack. He was known to intelligence services since last year when he disappeared before he could be deported after his application for asylum was rejected. Authorities knew he had pro-extremist sympathies. But no group has claimed responsibility for Friday's attack and no motive is known. Police say they have arrested a second person in connection with the attack, but have given no further information. Photos taken at the scene Friday showed the vehicle was a truck belonging to beer maker Spendrups, which said its truck had been hijacked earlier in the day. Witnesses say the truck drove straight into the entrance of the Ahlens Department Store on Drottninggatan, the city's biggest pedestrian street, sending shoppers screaming and running. Television footage showed smoke coming out of the store after the crash.